It's the most wonderful time of the year, and if you're anything like me, that means that you are woefully behind on your holiday shopping. Never fear. We are here to help! Here are some gift suggestions for the science fiction and fantasy fans on your gift list this year--there might even be some things that you want to put on your own list! For starters, Neil Gaiman's latest novel, The Ocean at the End of the Lane, is what I'd recommend for almost anyone this year. Readers of all ages (or listeners, if you get the audiobook ) can enjoy this wonderful story about memory, and magic, and family. For our Christmas gift to each other this year, my husband and I bought some art to hang in our newly-remodeled master bathroom. While Peter Jackson's Hobbit is sure to be a hit in theaters, we prefer the simplicity of this visual representation of Tolkien's novel, found in TeacupPiranha's shop on Etsy. The words are the lyrics to the dwarven song "Far Over the Misty Mountains Cold." 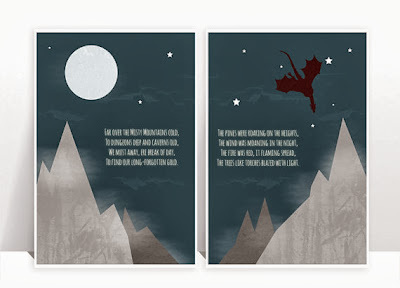 The shop also has many retro-style travel posters for places in Middle Earth, Westeros, and the Star Wars universe. What else have we found? I'm so glad you asked! Speaking of Star Wars, if you have a really good friend you need to buy for, or you just won the lottery, you could get the original Han Solo blaster for only $200,000. What are you giving or hoping to get this season? Link us your favorites in the comments. And happy holidays!